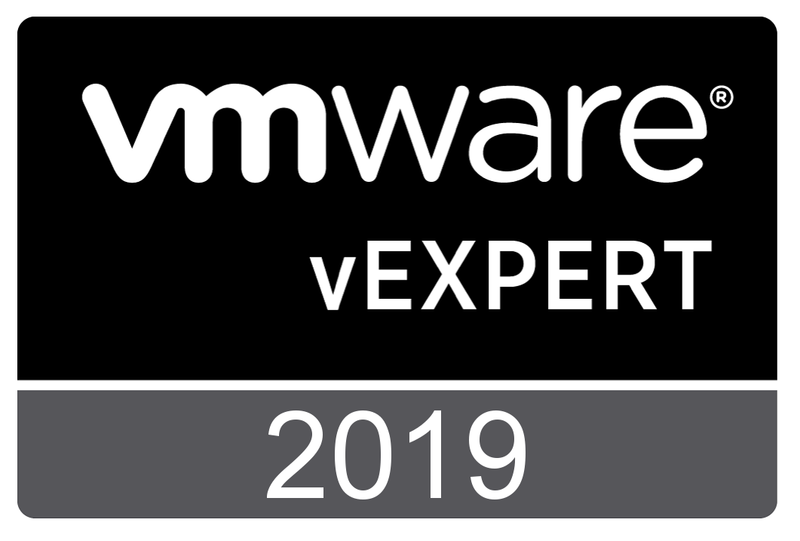 I’ve been quiet on my personal blog (I aim to rectify that) but in the meantime here a list of some of the blogs I’ve written over at Virtual Blocks, the blog for the Storage and Availability Business Unit at VMware about VMware Virtual Volumes (VVols). Some reflections why customers are moving to Virtual Volumes. VMworld 2015 is about to kick off in a few days and will be a hectic few days up in San Francisco. I’ll be there mostly talking and presenting on a variety of things like Virtual Volumes (VVol), Storage Policy-Based Management (SPBM), vSphere APIs for IO Filtering (VAIO) as well as covering some interesting work the SRM and NSX teams have been working on together. And I will also be taking part in a group discussion with @vmKen about VVols and a meet the experts session. In this short video you saw that the administrator selected a handful of Virtual Machines they wanted to protect, invoked a VRO workflow from the context menu, and was able to completely configure the replication and protection of the VMs in just a few seconds! In fact most of the video was me driving the UI to show you all the items (replication schedules, protected VMs, protection groups, recovery plans, etc.) that were created by the workflow. So What do We Need to Make It Work? How Did You Build The Workflow? The workflow was built by linking together various out of the box workflows provided by the VR and SRM plugins. I actually built two workflows so I could separate out the workflow that linked together the two plugins capabilities, and another workflow that wrapped the more complex workflow with some predefined attributes and a little scripting to simplify the presentation and make it easy to call from the vSphere Web Client. As you can see the workflow assigned to the context menu provides is basically a wrapper with a little scripting to allow me to use predefined RPO tiers when presenting the workflow and some predefined attributes to allow me to simplify the what I choose to present to the user. The workflow that ties the VR and SRM workflows together looks more complex, but most of it is simply chaining together out of the box workflows. Hopefully this has given you a glimpse into what you can achieve with these new automation capabilities. While there is a learning curve to vRealize Orchestrator there is also a lot of potential to streamline your operations. Being able to combine the automation capabilities of VR and SRM opens up a lot of new possibilities to explore. One of my colleagues asked me how I was able to present the RPO values as a drop-down list. To do that required me to configure the presentation properties of the workflow. Within vRealize Orchestrator you are able to control how parameters are presented to the end user in the presentation tab. Here I simply added a set of Predefined answers to a field I called ReplicationTier (you can also order and group the parameters that you present to the customer as well in this tab). RPO = 4 * 60; // set default to 240 minutes, i.e. 4 hours. This is the Lookup RPO from tier script task in the first workflow schema image shared above. Of course this is not necessary, you can just ask for the RPO value as a number input (with min and max values) but I thought the dropdown selection was a nice option to demonstrate. With the launch of VMware Site Recovery Manager 6.0 here are some useful resources for people that want to learn more about the new features, roll out a fresh deployment, or who are looking to upgrade. I’d also recommend checking out the blogs by GS Khalsa for SRM 6.0 and Jeff Hunter for vSphere Replication 6.0. Where Can I Download the Bits? Planning a Fresh Install or Upgrade to SRM 6? The SRM Compatibility Guide is also a must read! Because you do actually want to replicate the VMs don’t you? What Do I Need to Know About Deploying SRM 6 in Larger Environments? 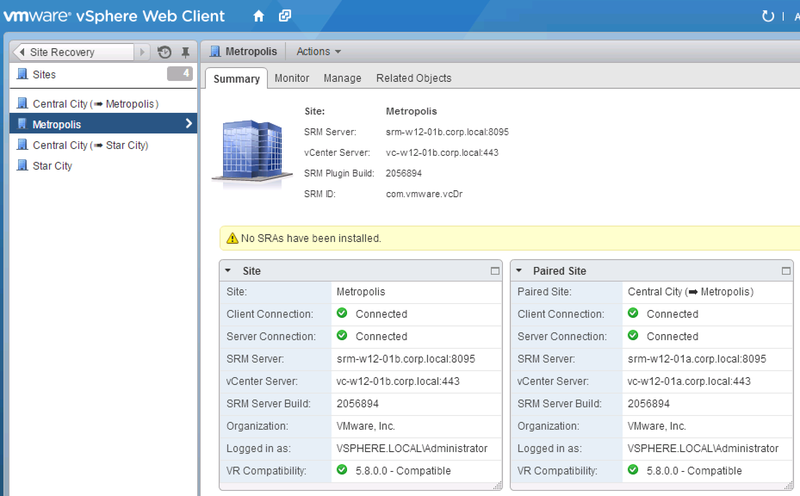 SRM 6.0 now supports up to 2,000 VMs replicated with vSphere Replication (up from 500 in the 5.8 release). SRM 6.0 continues to support protection of up to 5,000 VMs with array based replication. What Site Topologies Does SRM 6 Support? The SRM Administration Guide is a great resource, also Eric Shank’s SRM 5.8 guide is also largely applicable to SRM 6.0. If you have any questions on SRM I’d recommend posting in the SRM community at VMTN. With the release of SRM 5.8 the user interface was significantly updated to integrate with the vSphere Web Client for the first time. As part of the update of the user interface we improved a lot of things, like being able to add paired array managers at the same time, creating reverse inventory mappings, or my personal favorite enabling rule based IP reconfiguration. When demoing these new improvements to customers the feedback on these changes was very positive. One piece of feedback that I heard consistently (even in the SRM 5.8 beta) was the need to make it easier to create inventory mappings, especially at scale. As a result of that customer feedback one of the UI enhancements introduced in the recent SRM 6.0 release is the introduction of streamlined inventory mapping for networks and folder structures. Picture a scenario where you have a large number of folders or networks that you want to create inventory mappings for. In SRM 5.8 that process involved you either creating the mapping one-by-one in the user interface (and being able to create the reverse mapping automatically) or automating the process via the SRM public API or VRO plug-in. Now with SRM 6.0 you can just select the root of a hierarchy you want to map and all the child elements will be automatically matched by name for you. If you maintain consistent folder or network naming across sites this could potentially save a lot of time in creating the initial inventory mappings, especially for large inventories. 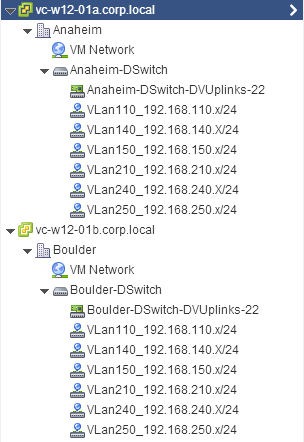 A lot of customers use folders to organize their VM inventory, in this example the VMs are organized by department and the same naming scheme is used on both sites for consistency. Here are the two sites, Anaheim and Boulder, with all the departmental folders organized under a top level “Production” folder at each site. When creating an inventory mapping you are now prompted to either select the existing mapping behavior where you select items manually, or the new automatic behavior based on matching names. Choose the new option and proceed to the next screen. 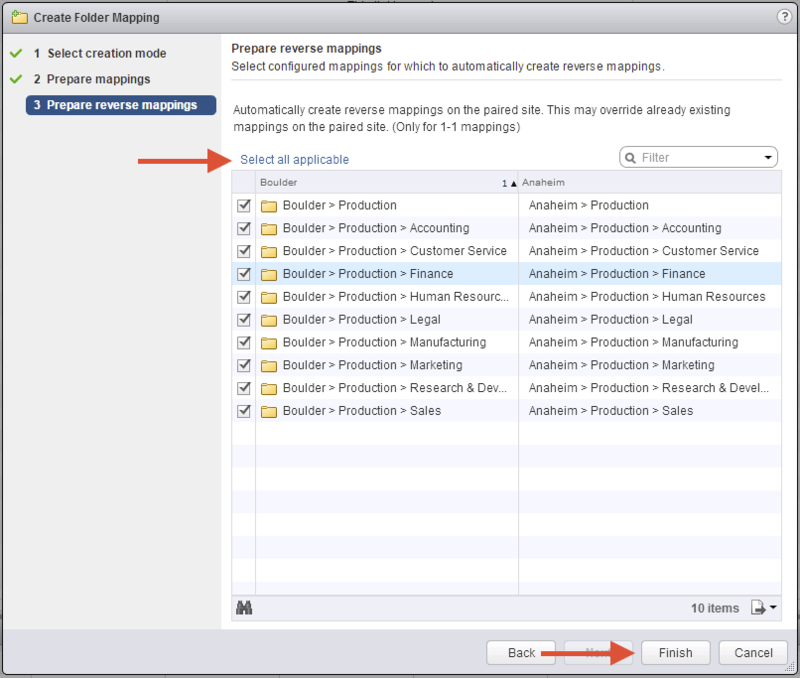 Now you will select the source and target “roots” for the folders you want to map. You choose the root folder on the left for the first site, followed by the target folder on the right for the second site. Then click the Add mappings button to generate the automatic mappings. A small confirmation box will pop-up showing the results of the automatic mapping. 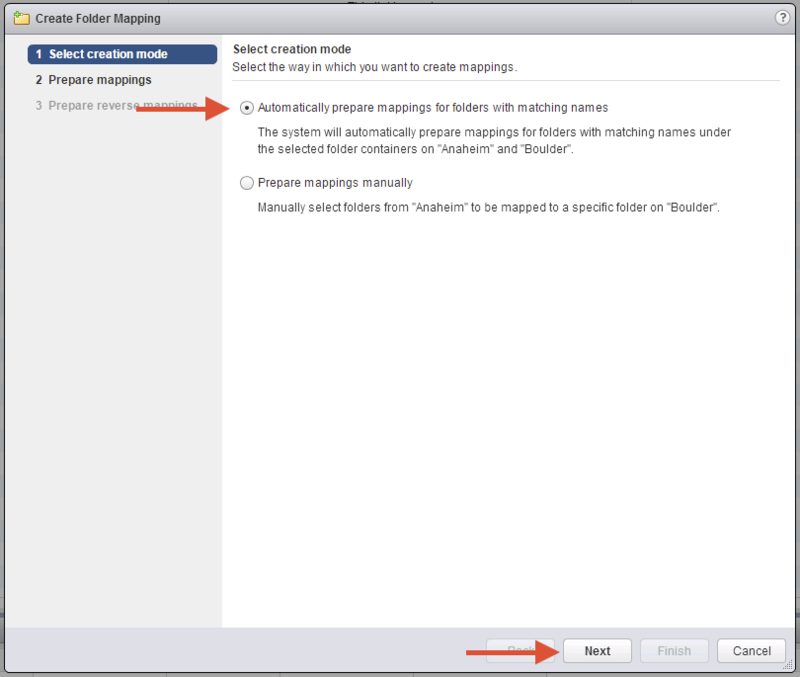 Next you can review the suggested mappings and go onto the next step in the mapping process. The final step is to decide whether you want to create the reverse mappings or not for these folders. If you do you can either select them one by one, or just click the “Select all applicable” link to select them all at once and then complete the folder mapping dialog by clicking finish. Just as we could use name based matching to speed up the creation of inventory mappings for folders we can also do the same thing for networks.Here’s an abbreviated walkthrough showing the same approach to configuring inventory mappings of distributed switches. First we can see that we have some distributed switches where the associated port groups have matching names across the two sites. In the same way we could select automatic mapping mapping for folders we can select the option to automatically map our networks as well. 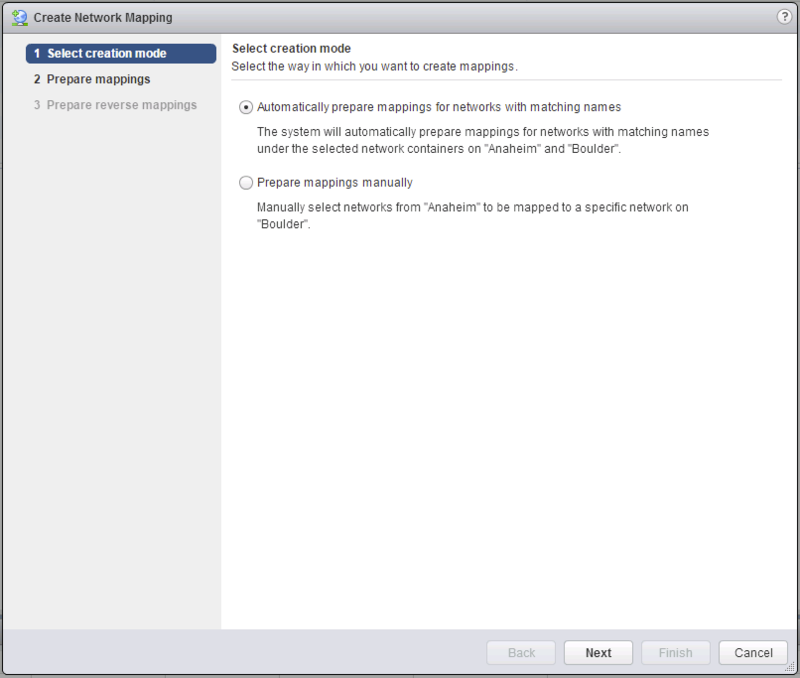 For the next step we select the distributed switches as the root of the mapping on both sites and click the “Add mappings” to generate the matches. After dismissing the popup and reviewing the proposed mappings we can continue on with the rest of the wizard to completion. If you are doing a small scale SRM deployment with just a couple of folders or port groups these enhancements are not going to be a huge deal. If however you deal with 10’s of folders or networks and have adopted consistent naming across both sites there is the potential for this to make your initial setup of SRM much more efficient. One of the improvements I was most happy to see in VMware Site Recovery Manager 6.0 was the simplified experience deploying SRM with external certificates. With earlier SRM releases external certificates were used to both authenticate the SRM instances with each other and also authenticate SRM servers to their associated vCenter instance. This dual purpose meant that there were several requirements and restrictions placed on external certificates that made it more difficult to quickly deploy SRM when using external certs. Another improvement in this release is that SRM 6.0 will warn customers who try and use certificates with SHA1 signature algorithms (SHA256 or stronger is recommended). Also in this release the insecure MD5 signature algorithm is no longer supported with SRM. While improved certificate handling is a fairly small improvement (and there’s still more room to improve) I do think it is indicative of the focus that the SRM team has been putting on improving the overall operational experience of the product. 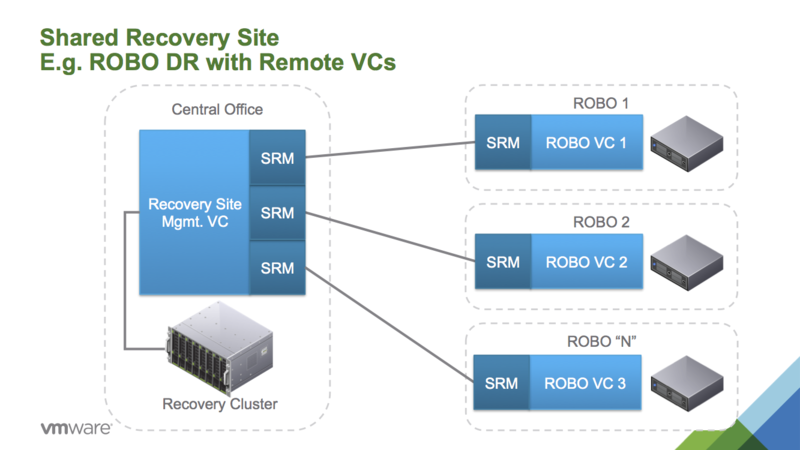 With the announcement of vSphere 6 one of the touted features was improved integration between Site Recovery Manager 6 and vSphere 6’s Storage DRS feature when using array based replication. Since SRM 5.5 and vSphere 5.5 the two capabilities have been supported together with some caveats. With the newly announced release the integration between the two will be much simpler. This post will focus on array based replication but as noted in Cormac’s post the SDRS and vSphere Replication integration has also improved. 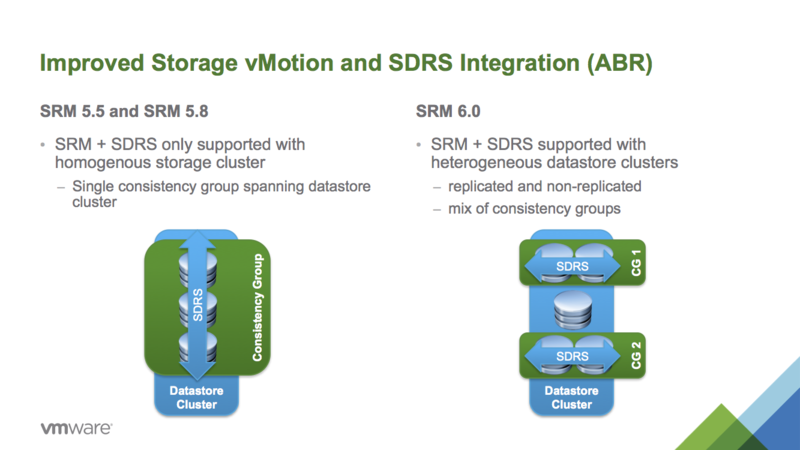 Since SRM 5.5 you have been able to use Storage vMotion to move protected VMs between datastores belonging to the same consistency group. However there was nothing to warn users when they were migrating a VM outside of the consistency group (or even onto non-replicated datastores) or prevent Storage DRS doing the same. Monitor Alarms: First, for storage vMotion you should ensure you are monitoring the appropriate SRM alarms to be informed if an administrator inadvertently migrates the storage of a VM (e.g. the SPVmLostEvent is a good one to alert on in this instance). Eric Shank’s SRM 5.8 guide provides a good overview of how to configure SRM 5.8 alarms. One Consistency Group Per Cluster: Additionally, prior to vSphere 6.0, Storage DRS was not aware of array based replication so could migrate a protected VM onto a non-replicated datastore or onto a datastore belonging to a different consistency group within the cluster. To avoid this you would have to set up your datastore cluster to only contain datastores belonging to the same consistency group. So What Changes in vSphere 6 and SRM 6? The SRM and Storage DRS teams have worked together to make SDRS aware of which datastores are being replicated and the consistency group membership. When SRM discovers replicated devices it associates information to the appropriate datastores in vSphere (e.g. that it is replicated and the consistency group), this information is then used by SDRS in deciding which automatic moves it can make, SDRS will not perform any automatic migrations that would impair the recoverability of a VM with SRM. With this change you don’t have to be as fine-grained with your storage clusters, or alternatively as coarse in your failover granularity. Now you can mix non-replicated and replicated datastores in the same cluster, and even replicated datastores belonging to different consistency groups. This reduces the operational burden of working with SRM and SDRS and provides much more flexibility in how you choose to organize your datastores and datastore clusters. 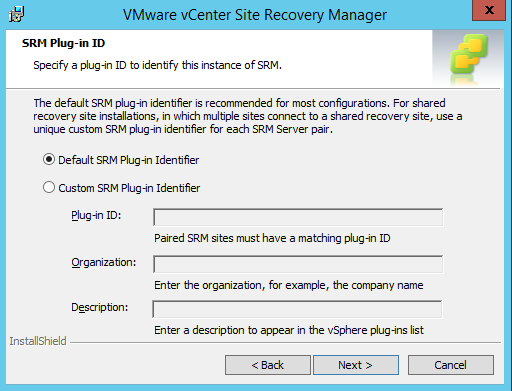 [Update March 17th 2015] – There is now a KB article, How Site Recovery Manager Handles Storage DRS Tagging (2108196), that goes into some more detail on how SRM and SDRS interoperate using tags. 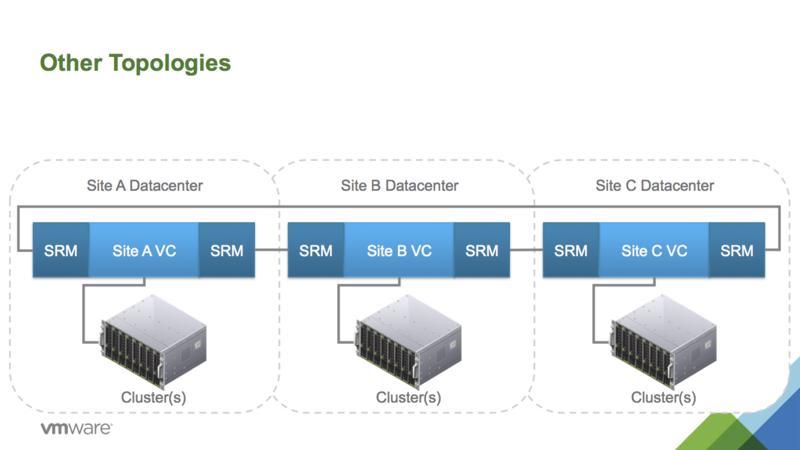 One of the topics that people often ask me about is what datacenter topologies VMware SRM supports. The good news is that SRM does have flexible capabilities for a number of topologies to help support more complex use cases beyond the typical two site deployment. 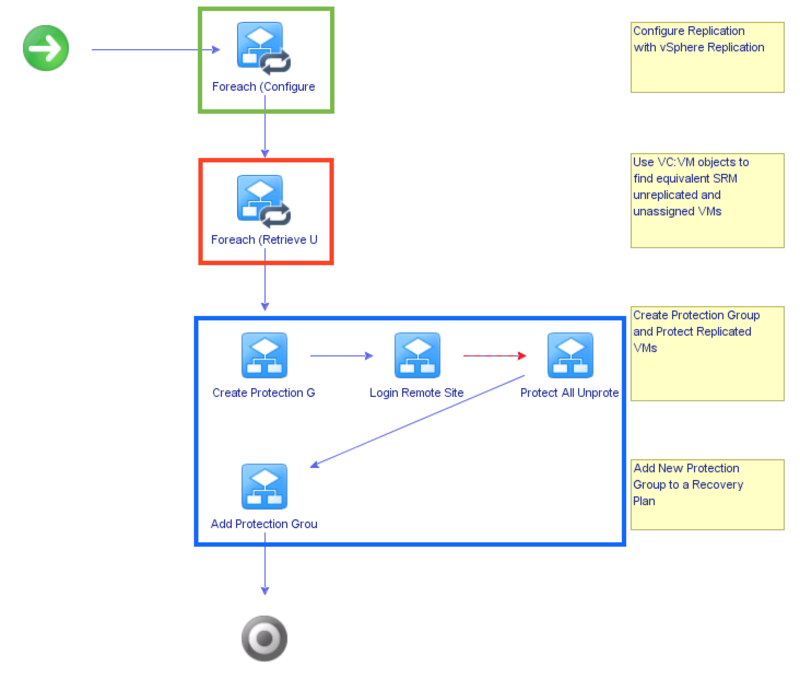 The shared recovery site use case is one of the more commonly seen topologies outside of a two datacenter deployment. This is a use case that has been supported by SRM for multiple releases and provides a good option for customers that are looking to protect virtual machines at remote offices that have their own vCenter instances. With this use case the customer is able to share the resources used for recovery amongst several remote offices. This provides flexibility in providing the resources required at the recovery site. A conservative approach would provide sufficient capacity to failover all remote sites to the shared recovery site. An alternative approach would be to oversubscribe the recovery site resources on the assumption that you wouldn’t need to recover all the remote sites at once. This second approach obviously has some benefits in terms of the potential for reduced capital expense at the recovery site but may add risk if there is a chance that all the remote sites may actually need to fail over at the same time. One of the advantages of this topology, with remote vCenters at each site, is that local IT retain full manageability of the infrastructure. Even in the event of a network outage between the central data center and the remote site the hosts at the remote site remain accessible. In contrast one of the disadvantages of this approach is that each SRM pair must be at the same major and minor version and each vCenter server must be a supported version for the SRM server joined to it. This means that upgrades of SRM or vCenter across the set of data centers should be carefully planned and coordinated. While the above topology is a common approach to providing shared recovery site capabilities it is not the only approach to achieving this. 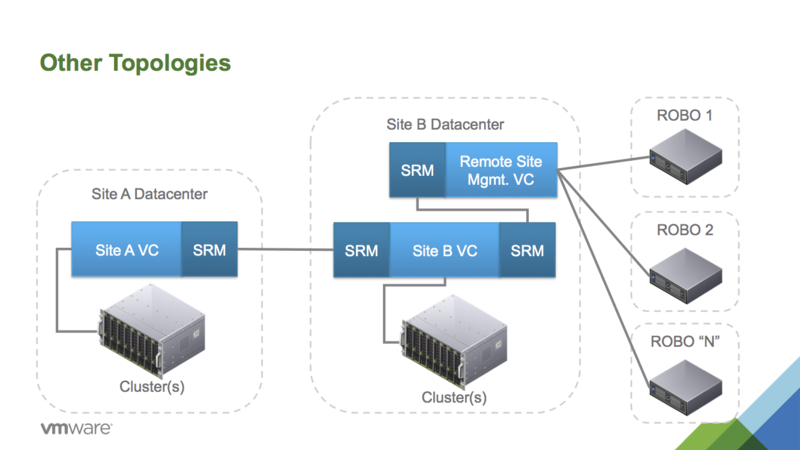 If there isn’t a need for each remote site to have its own vCenter instance then a simple single-pair SRM deployment could be adapted to meet the use case. 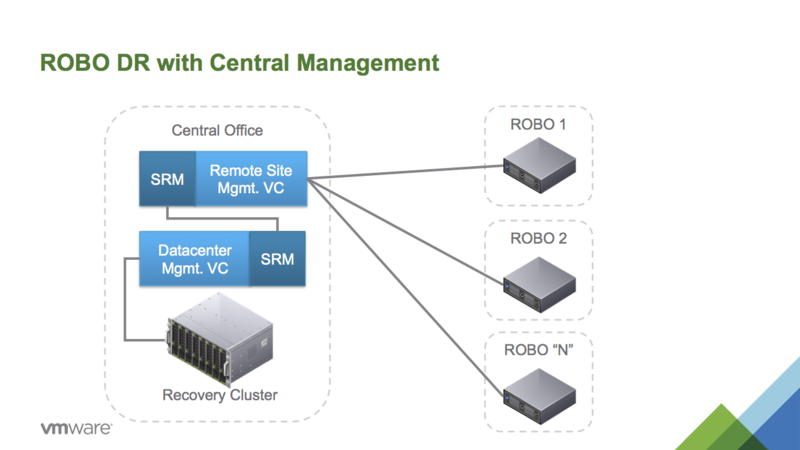 For this deployment you would deploy two vCenter instances, one to manage the resources at the recovery site and one to manage the resources at the remote site. 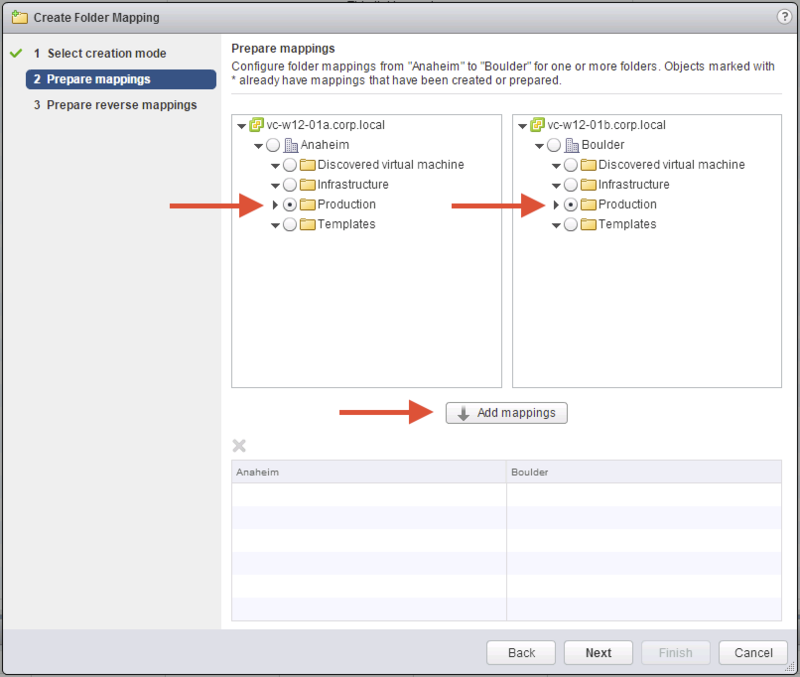 An instance of SRM for each vCenter would be deployed and the two paired together. You could then create recovery plans for each remote site but have a single shared vCenter to consolidate management of the remote sites. This approach has the advantage that upgrades of the vCenter and SRM instances would be somewhat simpler than the shared recovery site (fewer moving parts). Additionally you would be able to have different levels of recovery plan in the same SRM deployment. For example you could define a recovery plan for each remote office but also recovery plans for each region, grouping the remote offices together. 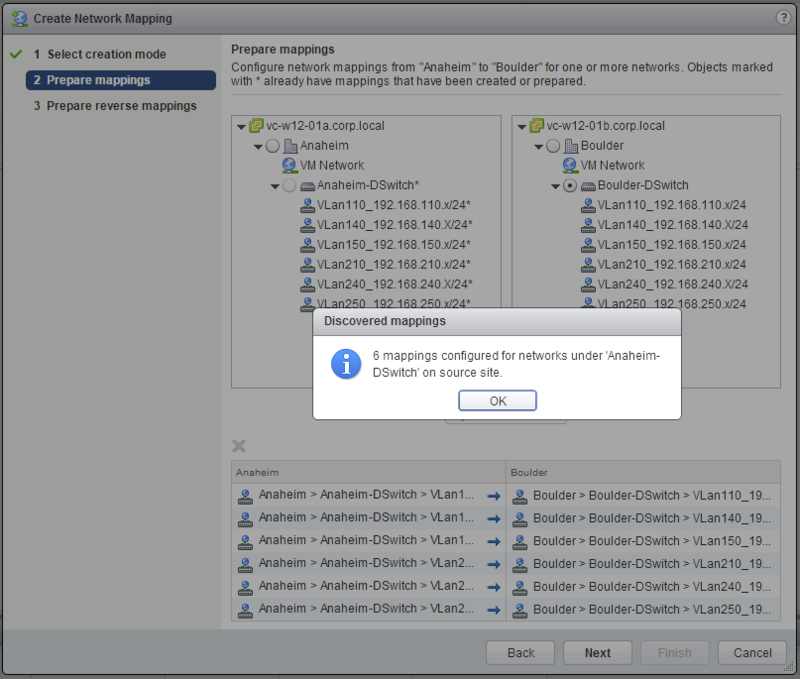 The disadvantage of this approach is that the remote infrastructure couldn’t be managed by vCenter when you lose connectivity. In addition to the shared recovery site topologies defined above I am often asked about support for other multi-datacenter topologies. Prior to the release of SRM 5.8 VMware supported some additional topologies using the Request for Product Qualification (RPQ) process. It is also supported to begin with a standard two site SRM deployment and later on add additional site pairings to add in more complex topologies. Another topology that might be of interest would be to have a traditional SRM pairing between two core data centers while also providing DR protection for remote offices to one (or even both) of the core data centers. The examples presented above are not intended to be exhaustive. As long as you don’t exceed the configuration maximums (use 10 or fewer SRM pairings) there are a wide variety of topologies that are enabled. With the introduction of the web client in the SRM 5.8 there have been several improvements in managing more complex topologies with SRM. The first improvement has been with the increase in supported SRM scale up to 5,000 virtual machines from 1,000 in previous releases. This makes it easier to consider deploying SRM across multiple pairs of data centers. One of the big user interface improvements is gained by integrating with the inventory lists of the web client. It is now easy to quickly switch between multiple site pairings. The lists of protection groups and recovery plans is also consolidated so you can see plans belonging to multiple site pairings at once. 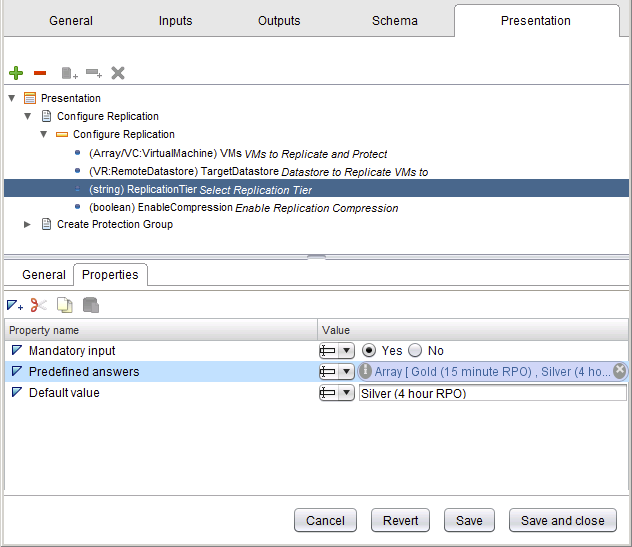 In addition to the consolidated views the various wizards to create new protection groups and recovery plans (for example) let users choose the target SRM pairing during creation. Finally the SRM installer has also been enhanced to make it easier to deploy multiple pairs of SRM servers without having to specify command line parameters to the installer. For the initial SRM pairing you would use the default identifier, for subsequent pairings each SRM instance in the pair should be installed using the same customer Plug-in Identifier (and each pairing should have a distinct identifier). Site Recovery Manager supports point-to-point replication. Site Recovery Manager does not support replication to multiple targets, even in a multi-site configuration. While SRM pairs do allow you to failover distinct workloads to different recovery sites, SRM doesn’t currently support orchestrating the failover of the same workload to different recovery sites. This means that SRM only supports managing a replicated datastore with one SRM pairing. Hopefully this article has outlined some of the newly supported capabilities available to SRM users. Planning multi-site disaster recovery strategies takes careful thought as to what you are looking to achieve but the new capabilities make it even easier to address a variety of recovery requirements. If you’re interested in learning more about SRM 5.8 then I’d recommend the official documentation, product resource page, the uptime blog, and Eric Shanks’ guide to SRM 5.8. One of the updated capabilities in the new Site Recovery Manager 5.8 release is the ability to change some recovery settings like the recovery priority and script callouts via the SRM API. With the release of PowerCLI 5.8 R1 these capabilities are also exposed for scripting via the SRM API! To make it easier to script against the API in PowerCLI I’ve been working on some helper SRM functions and have updated them to support some of the new capabilities. Here’s a short example using PowerCLI to update the recovery priority of a VM and add a new post recovery call-out. And here’s some code to perform something similar to what was done in the video using the custom SRM functions [at 2014-11-17]. Site Recovery Manager (SRM) 5.8 is Available! I am pleased to say that Site Recovery Manager 5.8 is now available! Streamlined deployment using new support for vPostgreSQL that provides optional embedded database option during SRM installation. As you can see from the list of changes there has been a lot of hard work put into this release by many people! If you are wondering SRM 5.8 supports the same set of SRAs as SRM 5.5 so no need to wait for an update from your storage vendor. 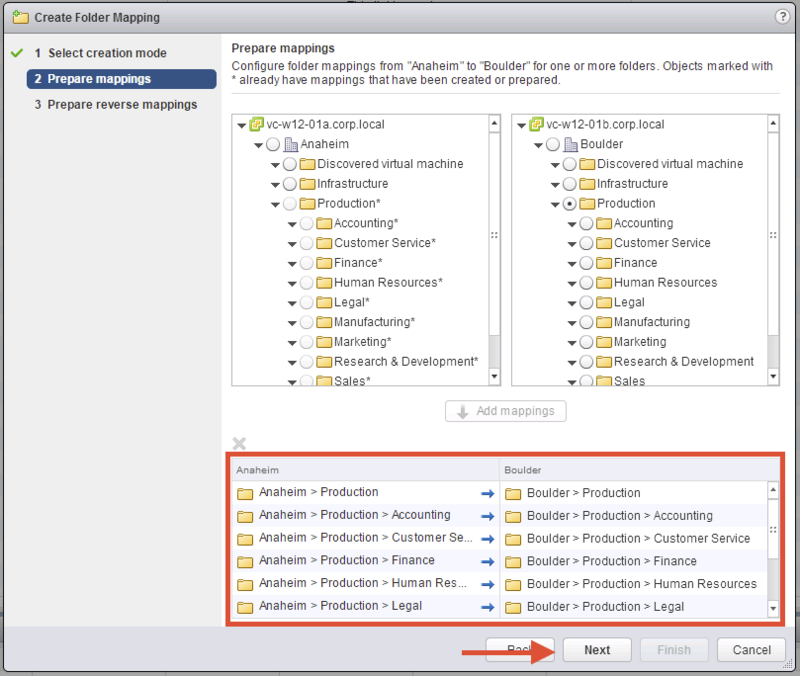 Check out the drivers and tools tabs for the SRAs and the vCenter Orchestrator plugin.